If there is one thing we have plenty of in Norway, it's mountains. 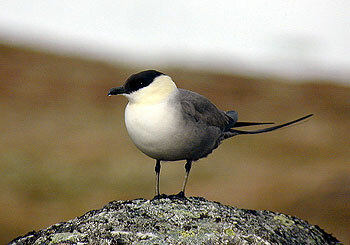 Typical mountain birds can be found in two types of main habitats: above the treeline in southern Norway (8-1100 m.a.s.l. depending on where you are) and in most of the two northern counties, where the climate put some of the same pressure on plant life all the way down to sea level. The best selection of mountain birds are found in two rather different mountain areas: Hardangervidda in the southwest and Dovre further northeast. Hardangervidda is the largest national park in Norway, and has a population of 5-10.000 wild Reindeer (Reindeer in northern Norway are domestricated). This is a real mountain area in the low- and middle alpine region. This means that the tallest plants are willows, and most of the terrain is covered with fragile heath vegetation. Numerous lakes hold the most important breeding populations of alpine diving ducks in southern Norway, breeding species including Tufted Duck, Greater Scaup, Common Scoter, Velvet Scoter and Long-tailed Duck. Other common waterbirds here are Black-throated Diver, Common Teal, Common Goldeneye, Common Gull and Arctic Tern. Shorebirds also breed in good numbers, including Eurasian Dotterel, European Golden Plover, Common Ringed Plover, Common Snipe, Great Snipe, Common Sandpiper, Redshank, Whimbrel, Dunlin, Purple Sandpiper, Temminck's Stint and Red-necked Phalarope. The willow shrubs hide species such as Willow Grouse, Fieldfare, Bluethroat, Willow Warbler, Mealy Redpoll, Reed Bunting and Lapland Bunting, while on drier ground there are plenty of Meadow Pipits, Northern Wheatears and Shore Larks. Snow Bunting and Rock Ptarmigan are found on the highest ridges and in more rocky terrain. The most common raptor species are Rough-legged Buzzard, Common Kestrel and Merlin, but Gyrfalcon also breeds with several pairs. Common Crane is a scarce breeder, but seen regularly. Stragglers and occasional breeders include Hen Harrier, Snowy Owl, Short-eared Owl and Long-tailed Skua, the presence or absence of these species depend almost totally on the rodent cycles. Another kind of mountain habitat with a different birdlife is found at Fokstumyra in the Dovre mountains. This is a nature reserve at approx. 900 m.a.s.l. consisting of numerous small lakes and mostly bogs. Birch forest surround most of these lakes, together with tall and thick willows this results in a larger diversity of passerines than at Hardangervidda. The number of ducks and shorebirds are much lower, though. This is a safer spot for Hen Harrier and waders such as Wood Sandpiper and Ruff are common. Common Crane is a breeder here, as well as large numbers of Bluethroats and Yellow Wagtails.